The Maronite ChapelatThe Basilica of the National ShrineofThe Immaculate Conception in Washington, DCDedication Date: September 23, 2011. WASHINGTON, D.C., MAY 31, 2011 (Zenit.org).- Construction has begun on a new Maronite Chapel at the Basilica of the National Shrine of the Immaculate Conception in Washington, D.C. The Eparchy of St. Maron of Brooklyn, who has spearheaded the project, announced that the Chapel will be named in honor of Our Lady of Lebanon. The Basilica of the Immaculate Conception is the preeminent Marian shrine in the United States, attracting nearly a million visitors a year. The new chapel was designed by Master Artist Louis R. DiCocco III, the president of St. Jude Liturgical Arts Studio of Havertown, Pennsylvania, who also worked on the Chapel of Our Lady of La Vang in the national shrine. The interior of the chapel will reflect the aesthetic of the intimate stone churches of Lebanon. A Syriac Cross will adorn the altar, as it does in many ancient churches in Syria and Lebanon, and a Cedar of Lebanon will sprawl out across the tile floor. St. Maron and Our Lady of Lebanon flank the entrance to the Chapel. 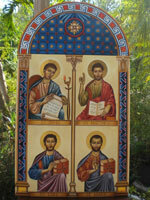 Behind the altar worshippers will see the four evangelists, the Crucifixion scene, and the Virgin and Child, taken from a 6th-century illustrated Book of the Gospels, the Rabboula. The dedication for the new chapel is tentatively scheduled for Sept. 23, to coincide with the 50th anniversary of Our Lady of Lebanon Maronite Seminary in Washington, D.C. and the 50th priestly ordination anniversary of Chorbishop Seely Beggiani, the seminary’s rector. The new chapel is part of a three-year project undertaken by the Eparchy of St. Maron of Brooklyn to financially support seminarians and retired priests, strengthen the missions, and renovate the eparchy’s cathedral in Brooklyn. On May 12, Bishop Gregory Mansour of the Eparchy of Saint Maron of Brooklyn, and Chorbishop Michael G. Thomas, the Eparchy’s Vicar General and Chancellor, held a benefit dinner in Washington, D.C. with Cardinal Donald Wuerl as the featured speaker. The Eparchy of Saint Maron of Brooklyn consists of 40 parishes and missions located in 16 states along the East Coast, as well as a seminary in Washington, D.C., a monastery for contemplative monks and a convent for religious sisters. “For so long, so many dreamed to have something of our own in Mary’s house,” said Bishop Gregory J. Mansour of St. Maron of Brooklyn, N.Y., who consecrated and dedicated the chapel. “I am so grateful for all those souls who made this day for Mary so beautiful.”Construction of the chapel — located near the shrine’s Memorial Hall — was spearheaded by the Eparchy of St. Maron of Brooklyn. Maronite Catholics, who are predominantly from Lebanon, take their name from St. Maron, a fifth-century Syrian hermit whose holiness and miracles attracted many followers, some of whom later brought Christianity to Lebanon. The chapel was designed by Louis DiCocco III, president of St. Jude Liturgical Arts Studio of Havertown, Pa. Bishop Mansour and Chorbishop Michael Thomas, the eparchy’s vicar general and chancellor, worked closely with DiCocco on the chapel’s design. 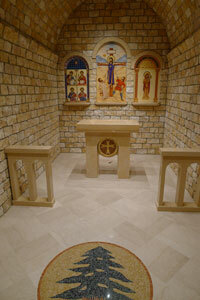 With its stone interior, the chapel was designed as “a deliberate attempt to place the worshipper in the stone churches of Lebanon,” a statement from the eparchy said. “The chapel of Our Lady of Lebanon is not only a strikingly beautiful addition to this great basilica but it is a sign of the Maronite Church’s place in the universal church. 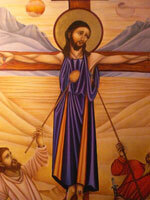 It also says something to us of pride, of hope and of the future,” Cardinal Wuerl said. The altar includes a Syriac cross, which was common to the ancient churches of Syria and Lebanon. The floor includes a Cedar of Lebanon design. Behind the chapel’s altar is a central image of the crucifixion flanked on the right by an icon of Our Lady with the Child Jesus and flanked on the left by an icon of the four evangelists. 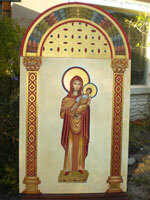 There are also images of St. Maron and Our Lady of Lebanon. “Here the Maronite faithful find a chapel truly reflective of their history, and their heritage and their faith,” Cardinal Wuerl said. “This chapel will stand as a constant reminder of the faith and loyalty to God” of Maronite Catholics. “One of the most ancient churchers is now represented with the newest chapel in the patronal church of the United States,” the rector said as he thanked the “many unseen hands and bodies” that worked on its completion. The Eparchy of St. Maron of Brooklyn consists of 40 parishes and missions located in 16 states along the East Coast. It also includes a monastery for contemplative monks, a convent for religious sisters and a seminary in Washington.